Before you drop $300 on the latest high-end headphones to listen to music on your iOS device, check to see whether an equalization (EQ) app can make your current cans, or even earbuds, sound like a million bucks—or at least close enough to that figure to satisfy your tastes. In an ideal listening environment, with perfect music files and perfect headphones, you wouldn't need to boost bass or tweak treble—so you wouldn’t need an equalizer for your music on your iOS device. But most of us spend time listening on the train, at the gym, or while walking along city streets—situations that from an aural perspective fall far shy of perfection—and with less-than-perfect headphones. That’s where EQ can make a big difference. EQ adjusts the frequencies of sound—or more precisely, of audio signals at particular frequencies, relative to other frequencies. A person with fairly pristine ears has a hearing range of from 20Hz to 20kHz (20,000Hz), with bass residing in the lower frequencies and treble tones at the higher end of the range. When you apply EQ to music, you can raise or lower specific frequencies. If you really like bass (or have a hard time hearing it), you can jack up the lower frequencies in the mix. If treble rankles your eardrums, you can push the higher-end frequencies down. iOS hides its EQ options in the Settings menu. EQ adjustments come in handy when you’re listening on the go, so it’s a shame that Apple parked its native EQ app in iOS 7 not within the Music app, as you might expect, but in Settings. Go to Settings > Music and you’ll see EQ just below Sound Check. 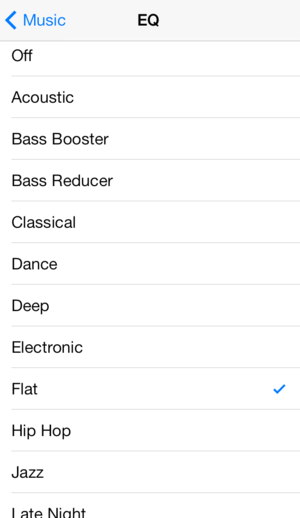 iOS 7 offers 23 preset equalizer settings, each based on a different combination of bass, midrange, and treble adjustments, and named (usually) for the genre of music Apple thinks they work well with: Electronic, Jazz, Hip Hop, and Rock, for example. The Bass Booster and Bass Reducer options do exactly what their names imply. 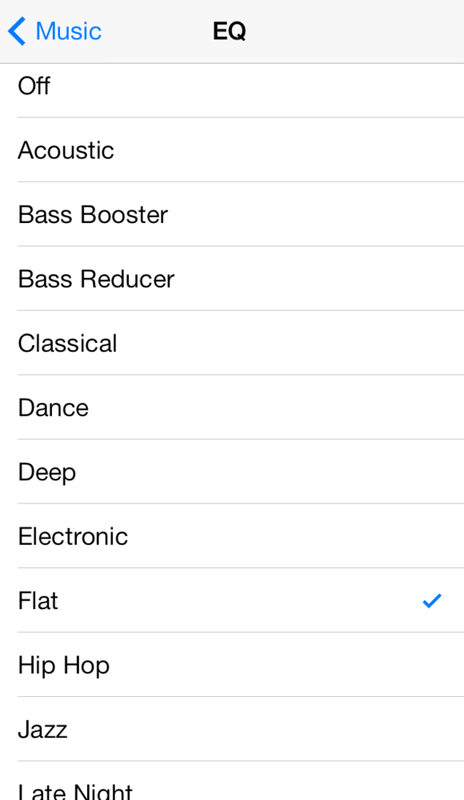 When you select an EQ option in Settings, it applies to all songs you play in the Music app. (Note that an EQ setting doesn’t actually change the source file; all of the adjustments it makes occur on the fly as the song plays.) 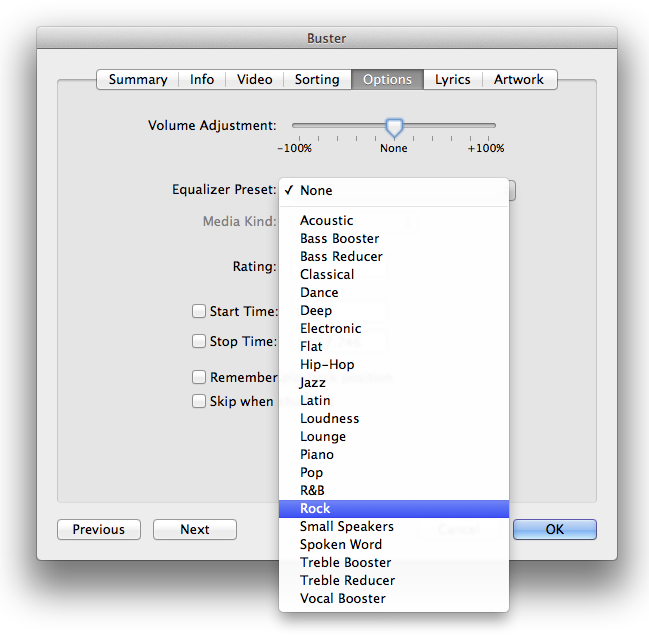 But if you crave greater flexibility in your EQ settings, such as always using the Rock setting for Led Zeppelin but switching to Hip Hop for Eminem, you can turn to iTunes on your computer for help. Keep in mind, however, that iTunes Match and EQ don't appear to play well together. To explore the EQ settings in iTunes, first choose Window > Equalizer to see a visual representation of the affected frequencies. Try selecting Treble Booster and then switch to Bass Booster and you’ll see a significant shift as the virtual knobs dance around to their new spots. By default, iTunes applies the EQ you select to all songs, but you can assign EQ settings on a per-song basis. Use iTunes' Equalizer window to pick an EQ setting that fits your taste. To do so, select a song and press Command-I to open the Get Info window. Click the Options tab, and you’ll see several settings that you can adjust for the song. In the Equalizer Preset pop-up menu, pick the setting you’d like for that song and click OK. Not only will the song always play with that EQ preset on your Mac, but the preset will carry over when you sync that song to an iOS device. If you create a custom preset in iTunes through the Equalizer window, however, those changes won’t carry over to your iOS device. Also, if the EQ on your iOS device is set to Off, the device will not play the preset you’ve selected for any song. And keep in mind that using EQ can have a negative impact on your battery life. You can select a different EQ setting for each song via iTunes. If you want more control over EQ in iOS 7—and you’re willing to forgo using the built-in Music app for playback—you can choose one of several apps that offer lots of additional flexibility and functionality. For example, Onkyo’s free HF Player brings touch control to custom EQ settings. You can easily create detailed custom EQ settings for tracks on your iOS device with Onkyo's HF Player app. In the app, you select the song from your Music library, and then tap the Equalizer button. Push up on the frequencies you want to boost or drag down on the ones you want to lower. You can create detailed custom settings and save them for later use. Like the built-in iOS EQ, the app applies that preset to all songs, but switching within the app among your choices while you’re playing a song is a lot easier. Aphex’s Audio Xciter takes a different approach to EQ. Instead of having access to specific frequencies, you control Tune, Harmonics, and Mix settings, which the app uses to tweak the sound output. The advantage of this method over a standard EQ is that the app keeps all the levels in the song balanced, resulting in a mix that hopefully is more similar to the original. The app requires a $1 in-app purchase to unlock this functionality, but you can try it for 5 minutes a day before you buy to see if it’s worth it. 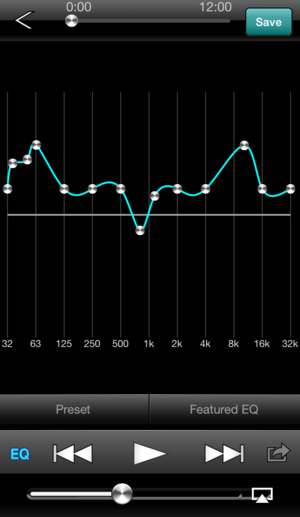 Whichever option you try, you owe it to your ears to give an EQ app a try. You may find a whole new world of listening—no new headphones required.